During gestation and lactation periods, the experimental mice dams received the following treatments: a) diet free of pesticides (MC); b) diet enriched with atrazine (ATZ); 31.0 ugkg-1 (MA); c) diet + oral vitamin E (α-tocopherol); 200 mg/kg/mouse (ME); and d) diet enriched with atrazine; 31.0 ugkg-1 + oral vitamin E; 200 mg/kg/mouse (ME/A). Pups of the experimental dams were designated as PC, PA, PE and PE/A, to sign control, ATZ, vit E and vit E + ATZ treated groups, respectively. ATZ treatment didn't affect body or liver weights of mice mothers, while caused high elevation of the pup's body and liver weights. 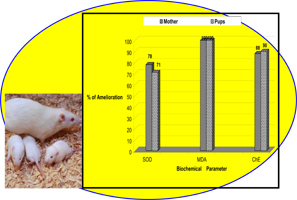 Either in mice mothers or their pups, ATZ induced high elevation of serum alkaline phosphatase (ALP), plasma urea and liver malondialdehyde (MDA), while decreased levels of plasma butyryl cholinesterase (BuChE) and liver super oxide dismutase (SOD). Administration of vitamin E in conjunction with ATZ clearly normalized values of these parameter to that of control ones. The ameliorative effect of vitamin E to SOD, based on calculating what so-called "Ameliorative Index; AI" was accounted to 0.78 and 0.71, respectively for mothers and pups. The AI for MDA reached a maximum value (1.0), either for mothers or pups. The histopathological examination revealed that vitamin E supplementation repaired the impairment of ATZ to the studied organs (e.g., kidney, liver & ovary).